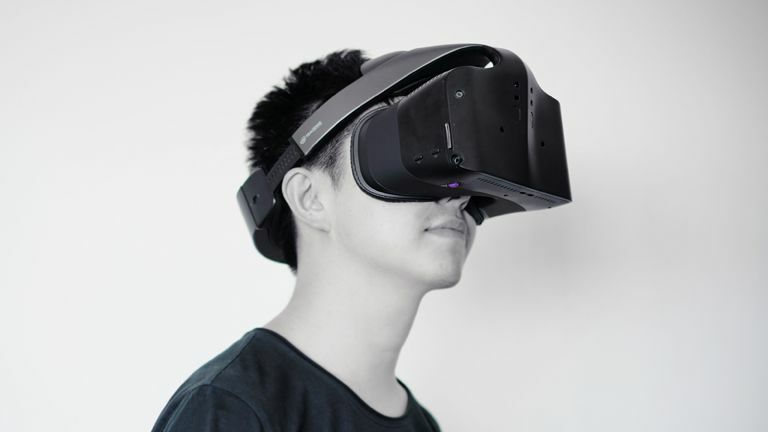 And, foremost among the big VR players at the show, which include Oculus, HTC Vive, Virtuix and more, is Intel, who has brought the VR hard to IEM 2017. That's because they believe in the power of the technology and, as Steve Shakespeare is keen to tell me, because they see few limits to its potential applications. Steve Shakespeare: Yes, sure, the background is that we're seeing a huge appetite and interest for VR and the experiences that VR bring to life. Not only in gaming but in business as well - so we see both of those as a massive opportunity moving forward. Of course, at Intel our specific background behind VR is via the processors that power those experiences. We really feel there is big opportunity for us to deliver and enable truly immersive, exciting, compelling virtual reality experiences that consumers will want to take advantage of and the businesses will want to take advantage of. T3: So you don't feel that it is gimmick? We love VR tech here at T3, however, there are some commentators who still feel it doesn't have sustainability. SS: I certainly don't feel it is a gimmick. I feel VR is here but that we are kind of at an inflection point really in terms of the technology. We've got to a point now with the processing capability that underlines that, so we recently launched the 7th generation Core family of products and with those they really do enable truly immersive, seamless virtual reality experiences. And I feel that becomes a fundamental part of the sustainability of this. We've got to have computers that deliver great experiences that people truly enjoy and value, so I think that the difference here is that we've got to a point in time where we can do that, and actually there are some wonderful demonstrations of that right here at the Intel Extreme Masters 2017. I would encourage you to go and have look! The software that you are seeing for computer gaming and the like is truly immersive right now, and it is high quality, high definition content in a virtual reality world. And we get a lot of feedback from people who say that they love it. They love that immersive experiences. So as long as the video is streaming smoothly and you've got a high performance experience it works incredibly well. So that is what I think is going to make it sustainable. If you look at the over 1000 software titles already available on VR platforms and the growing software ecosystem, you see that we are at an inflection point where it all starts to take off. In the business world we're seeing companies look at how they can use VR. I mean you've got this really interesting opportunity to help people learn how to do things ahead of actually using them in the real world. So we've got examples of medical physicians using virtual reality to train and simulate how to do heart operations or brain operations. And, in doing that, it's giving them the expertise to be more successful when they do the real thing. T3: What's your position in relation to the current big players in the VR hardware market and how open source or proprietary the technology should be? SS: Well as it stands today we are looking to work with everybody. We believe we have the best computing platform with our latest technology, which enables those experiences in a great way, and we want to support all of them. Whether it is HTC Vive, Oculus Rift, whether it is Microsoft with the announcements they've made, we're looking to work across all of those platforms moving forward. So candidly I don't really have a position regarding whether it is open platforms or proprietary platforms. I think that will be for the industry to develop over time. I suppose history tells us that the more open a platform is the more growth and development it sees, however. SS: They are certainly related. So VR is a truly immersive experience whereas augmented reality is complementing the real world with computer generated, additional information and content. So we certainly see these two technologies coming together over time. We've done some early innovation with our own Project Alloy, which is still in development, however we expect to have some platforms coming soon around that. We're really trying to bring together a combination of augmented reality with virtual reality to deliver another dimension to this solution. SS: I think we're going to see stuff really soon in education to be honest. From what I'm seeing, I think we're going to see a lot of headsets becoming more accessible as the prices come down and the economics of the product line develop. We are continuing to innovate all the time and bring new platforms to the market that accelerate the experience more effectively as well. So I think the products are going to come to market sooner and with more accessibility. T3: Why do you feel VR didn't take off until now? SS: Well I think to have a really smooth virtual reality experience the headset needs to deliver, in our experience, more than 90 frames per second. So you have to imagine what is going on to make that happen. You've got to deliver 90fps as otherwise the immersion isn't as high and can even make people feel ill, so you've got to have high performance to do that. At the same time, however, you've got to have the ability to do all of the compute calculation involved with the physics of the VR environment and any AI involved. So all that computation demands a great processor. And I feel that today we've got to a point where we've got products in the market that can enable that. Our latest 7th generation of Core products deliver that performance and enable greater than 90fps. They've got that raw compute power to deliver all of those great experiences. For example, take the game Arizona Sunshine, the really cool zombie game we've got running here at IEM 2017. Now that will run on an older PC, however, on a modern PC you get more zombies and when you shoot them they blow up into loads more parts, because all of that requires more processing horsepower. You get a fundamentally better and more immersive experience. And that is why we're committed to continuing to innovate our CPU products every year, and committed to working with the VR ecosystem both in terms of hardware and software. To find out more about how Intel are helping to deliver cutting edge VR experiences, head on over to the company's dedicated virtual reality hub now.